For many years, I did not believe I could cook. My late husband, who was a wonderful cook, repeatedly told me that I was terrible at it. It was one of the ways he kept me feeling helpless and dependent on him. After all, he said, if he didn’t cook for me, I would starve. Truthfully, I was terrible. I had no experience. But I never had the chance to learn. I was only allowed to be the assistant in the kitchen. I followed orders, mostly chopping and peeling. And I was told that I didn’t do that very well either. When I married Paul, I was sure he was going to be disappointed in my lack of culinary skills. I told him that I couldn’t cook, but he said he didn’t believe that. There was nothing I couldn’t do if I made my mind up to do it. So I tried. I never made anything down right awful, but some meals were better than others. I was surprised at how much I had absorbed just watching Lorenzo cook. I decided maybe I could cook after all. I had always told everyone that I hated cooking but I realized that wasn’t true. I just said that because I believed I couldn’t do it. But here I was making really good meals. Even I liked what I made. And with a little more time and a few basic technique classes, I could be a really great cook. This past Sunday, as I moved around the kitchen preparing one of Paul’s favorites – jambalaya, and the delicious smells from the simmering pot filled the air, I thought about who I was and who I am now. For a very long time, I allowed another’s critical remarks to define me. I had a distorted view of my character and abilities. I believed that I couldn’t do something or was very bad at it, simply because that’s what I was told. In truth, part of the reason I accepted those judgements was my own fear; the fear that it might be right, that I really was incapable. I don’t do that anymore. When someone, anyone criticizes me or tells me I can’t do something, I think about it. No longer do I have the knee-jerk reaction that they must be right. I consider what was said. I slow down and take a deep breath. I ask myself if it is true. I don’t allow my fear of failure or inadequacy to run the show. And guess what? Paul was right. There isn’t much I can’t do if I put my mind to it. Now I look forward to preparing meals and something I dreaded and was ashamed of has become a real pleasure. So. Now. What else is out there waiting for me to try? 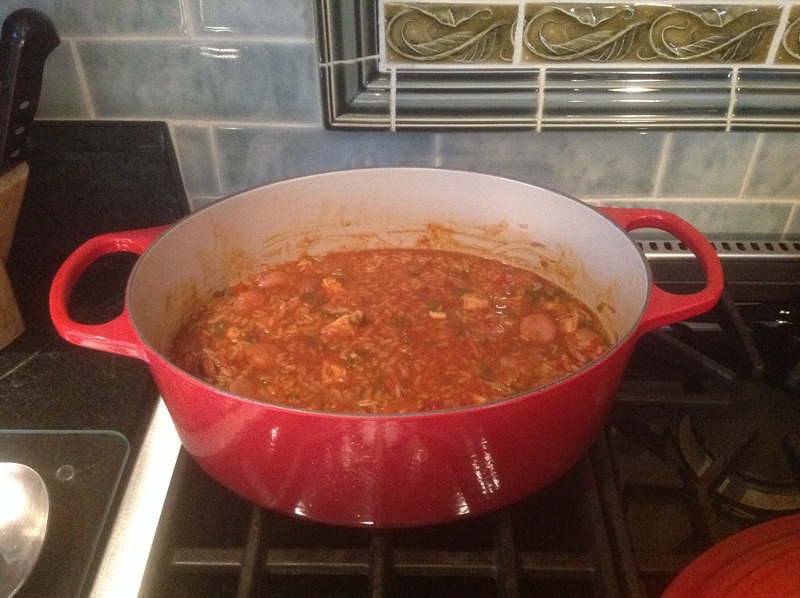 This entry was posted in Daily Life, Encouragement and tagged cooking, jambalaya. Bookmark the permalink. 2 Responses to What’s Cookin’? Way to go! I used to be terrible at cooking as well and assumed I’d never get better. Go us! Yummy! Where’s the recipe ?